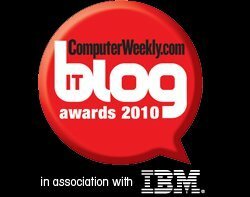 IT Blog Awards 2010: Project Management - category information. quality="high" bgcolor="#ffffff" width="120" height="220" name="cw_badge10_proj_man" align="middle"
Computer Weekly’s search for the best blogs in IT is now in its third year, and this year’s competition, brought to you in association with IBM, promises to be bigger and better than before. The Awards will reward the best comment and insight that the UK’s IT industry has to offer at an awards ceremony on 18 November at the Delfin.